On this episode of Working: Syracuse, we explore the gritty and often invisible job of crime-scene cleaner Luke Parkhurst of Disaster Cleanup. 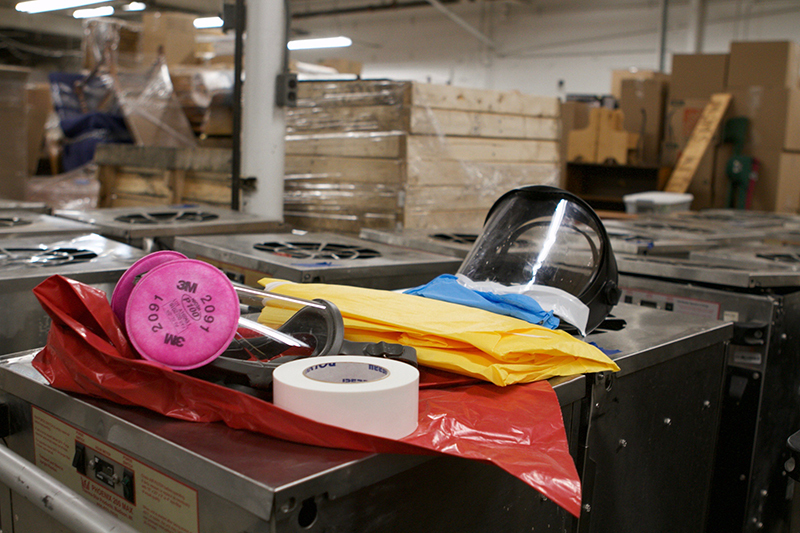 The 40-person company specializes in biohazard, fire, mold, and water jobs within a two-hour radius of the city. The biohazard jobs are the most difficult of the bunch. Many of those cases involve the suicide of a family member. But even though he's scrubbed away blood and bodily fluids for 14 years, Luke believes those years of cleaning up after one of the saddest days a person can face hasn't changed him. He's married with two kids — a six- and seven-year-old — and joined Disaster Cleanup two years ago. He's held jobs in welding and factory work and usually can be found around the company warehouse wearing his blue-denim overalls. And while this particular job hasn't changed him, it "makes you think about all the other jobs that people are doing that people don't want to think about," Parkhurst says. 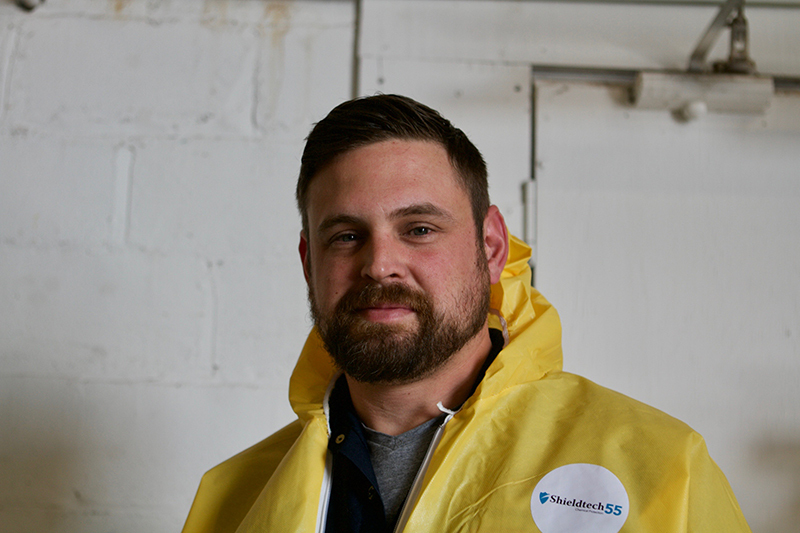 Disaster Cleanup manager Luke Parkhurst possesses 14 years of experience, eliminating the messes created by water, fire, mold, and biohazard, which he says are the most difficult of the bunch. 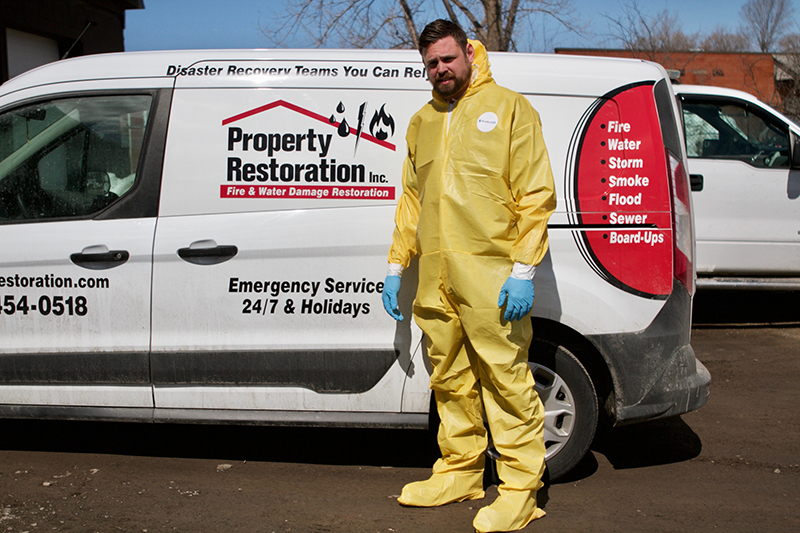 "So we meet with the homeowner, and they show us and we get all suited up," says Parkhurst. "We go in there and cut out whatever we have to cut out — sometimes we bend the floors, sometimes we're actually cutting subfloors out if it leaked." 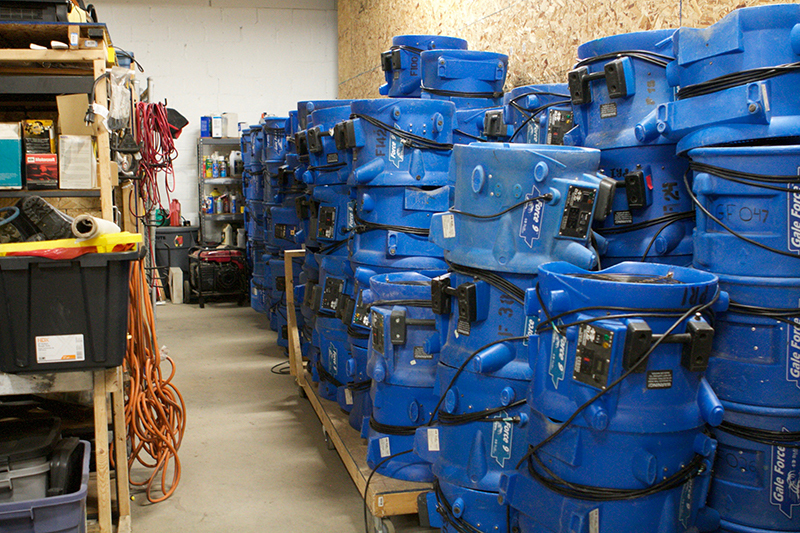 Parkhurst uses these industrial dryers to eliminate the range of liquids he encounters in the field as quickly as possible. Parkhurst, standing in his protective gear (a hazmat suit and gloves), says that the hardest cases to forget are the suicides. BRONTE SCHMIDT, HOST: Hello and welcome to Working: Syracuse, the podcast inspired by journalist Studs Terkel featuring Salt City residents talking about what they do to earn a paycheck and how they find meaning in those jobs. I'm your host Bronte Schmit. On this episode our reporter Tiffany Moran spoke to Luke Parkhurst of Disaster Cleanup. When a violent crime happens, the police leave after they've interviewed witnesses and sourced the scene for evidence. But often after the last officer exists, a mess still remains. That's where Disaster Cleanup comes in. Parkhurst and his team take care of the mess. Television dramas, news programs, or the latest blockbuster film rarely reveal how all that blood is removed. But Parkhurst knows. Due to the graphic nature of Parkhurst's work, this episode contains content that some may find disturbing. LUKE PARKHURST: The messiest job that I had to deal with was probably the one that I did where there was just, where the guy committed suicide in the small room probably only you know probably eight by six or so. A little sunroom between a garage and he and he committed suicide in there and it was just brain matter and skull and blood everywhere all over the walls all you couldn't, there wasn't like a square inch that wasn't touched by anything. So, that one was pretty rough and I had to go there late at night by myself and walk through there and uh with a brother that was really upset and you know walking on pieces of his skull and everything and just to go in there and see what work we had to do that night. That one was really, really messy. TIFFANY MORAN: Parkhurst works for Disaster Cleanup in Syracuse, NY. He has short, dark brown hair, a scruffy beard and stands just over six feet tall. As he strides through the company offices on Thompson Road in East Syracuse, the 36-year-old lumbers about with large brown boots and a worn blue uniform. LUKE PARKHURST: My name is Luke Parkhurst. I've been with property restoration now for two years. I've been in the industry for about 14 years. TIFFANY MORAN: Co-workers greet Parkhurst as he walks through the combination office and warehouse building with a smile on his face. The nondescript, cream and brown colored building sits a block from 690 East without inviting any attention to itself... Parkhurst might be headed out to a bio cleanup or mold job in the morning; whatever it might be, he's always on the move. The job is different every day, but that's one of the reasons Parkhurst enjoys it so much. LUKE PARKHURST: So we meet with the homeowner, whoever it is, and they show us and we get all suited up, we go in there and cut out whatever we have to cut out, you know, sometimes we bend the floors, sometimes we're actually cutting subfloors out if it leaked, sometimes there's been bodies where they decomposed and go through the floors into the next level where we're cutting out ceilings, and removing ceilings and everything. TIFFANY MORAN: The trips to people's houses to clean deliver a lot of emotional turmoil. In fact, it's near impossible to prepare oneself for some of the distress, drama and nightmarish scenes they walk in to. LUKE PARKHURST: I've had conversations with families that have lost their kids and they tell me how great they were and how their kids were into this sport or that and they didn't know it was going to happen. I've had one's where wives have killed their husbands or vice versa and I see pictures of them on the wall and it's a little weird. A little different. Seeing the pictures of them being happy and then to that, what I see. We had one where a lady left a fetus in a toilet and just ran off and we had to deal with that. The guys definitely see some different things. We don't ever really know what we're up against. It's really just, the suicides are the worst for us. Just cause it's a lot more of a mess and a lot more, you feel compassion for them I guess. It's hard not to. Cause, you know that was a human that you're cleaning up. They had a life, they had a family, you know, a job. All that. And now that's done. So it definitely makes you think a little bit. About life I guess. TIFFANY MORAN: This line of work takes a toll on everyone. The severe physical and mental stresses are present and finding ways to deal with them is central to the job. LUKE PARKHURST: At first I didn't want to do it. At all. I told them that I would not do it. And they were fine with that, the first company that I worked with, but after a while, I had to do one one day, it just kind of- there was nobody else there, and I just said I was willing to do it. It was nerve-wracking at first because you go down in there and the smell and everything is strong so we come in masks and everything. We wear stuff but you can even still smell it through that sometimes. And to get your stomach able to do that, for a lot of people, a lot of them even their stomachs can't handle it. And the first one I did, when I walked in I was like "oh man, I don't know if I'm gonna be able to do this..."
TIFFANY MORAN: Luke's coping mechanism consists of him keeping a one-track mind on the job. He says that he focuses on getting in there and getting the job done, a tactic that halts his mind from wandering and allows him to tackle the task at hand. Without that focus, the details of the job and the lives connected to the work can consume a person. But Luke works to keep those mental detours at bay and appreciates the perspective his work gives him. LUKE PARKHURST: It definitely makes me not complain about the little things, I guess, in life. Because these people definitely had more of a problem in their life than I do to get to that point to do that. So it definitely helps me be thankful when I get home. You know, my wife is always like "I can't believe you would do that stuff at all." You know, she couldn't see me doing it at first, but it has to be done. TIFFANY MORAN: Emergency work like Luke's means he has to be on call all the time — even his time off the clock isn't quite what it seems. LUKE PARKHURST: I pretty much never have a full day off I would say. Either cause guys are getting jobs or calling me asking me questions, I always have to have my phone on me you know. Being on call. TIFFANY MORAN: Luke refrains from sharing the details of his job with his kids who are 7 and 6 years old, too young to understand what he does. LUKE PARKHURST: I don't tell them any of that. They just say that I clean for a living. [laughs] That's what my kids think. But I do a lot more than that. TIFFANY MORAN: It's tough for his wife too because he gets called out at all hours of the night. LUKE PARKHURST: I missed out on things. I missed out on my son's birthdays before. I've missed out on you know, Christmases, a lot of different stuff over the years. I've missed out and yeah it's been tough for her cause two, three o'clock in the morning I'm gettin' up and you know making noise and the kids are trying to sleep and I gotta get out and go to work. TIFFANY MORAN: Luke and his team get to the scene after the police do everything they need to do, but it doesn't always spare them from the worst of the worst. LUKE PARKHURST: There have been a couple of them that I've been to that I definitely would want to do alone. We had another guy that used to work with us that, he was always, I liked going with him because he would make it, you know, easier for me. Joke about other stuff, get my mind off of it. LUKE PARKHURST: Because if I was just in there by myself, I would think about everything. I want to know why this happened, what happened. Your mind thinks and he was always just good at telling me "get in there and get it done and get out." TIFFANY MORAN: Knowing that he's helping people out at some of their most difficult times is an aspect of his job that Luke admits helps to make it more satisfying. LUKE PARKHURST: I guess the part that we would enjoy is helping out, even in a bad situation, you know, we've seen homeowners crying in front of us and they're still thankful that we're there to do it. You know, to help them out that way is probably the only thing that's, you know, rewarding for us at all. Other than that it's kind of get your mind off of it, go in and do it and get out kind of thing. BRONTE SCHMIDT, HOST: Thanks Tiffany. Parkhurst's job might cause people to assume he's weird or that he brings the troubles of his work home, but he recognizes that his job is unconventional. On the weekends, when he's not spending time with his family, he's playing guitar for his church band. BRONTE SCHMIDT, HOST: That's all for this episode of Working: Syracuse. Check out our website www.working syracuse.com for more interviews as well as some extra content on Parkhurst. Be sure to follow us on Facebook and Twitter @WorkingSyracuse. Thanks again to Tiffany for speaking with Parkhurst. This episode was written and produced by Zac Palmer. Extra reporting came from Zac and myself. Our theme music was by Logan Piercey. I've been Bronte Schmit. It's time for us to clock out.